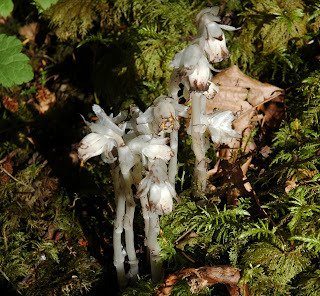 Why I like being here: Indian Pipe - plant, fungus or what? The first time we went camping at Porpoise Bay, on BC's Sunshine Coast, I spotted this odd, white growth on the floor of the forest. It was just off the main path from the campground to the beach. I was amazed by the fact that it was totally white - not a hint of green at all. At first, I thought it must be a fungus, because I didn't understand how it could photosynthesize without chlorophyll. I took this photo as much for reference, so I could look it up when I got home. It turns out that it does indeed have no cholorphyll but it is in fact a flowering plant. This plant apparently gets all its nutrition from a symbiotic relationship with a fungus that itself is dependent on the roots of certain species of tree, including some of the big conifers that grow here in the Pacific Northwest. The plant is called the Indian Pipe, presumably because of its resemblance to clay pipes for smoking. To find out more about this amazing plant, check out this article, which is ironically from right over the other side of the country.